Born on 16 November 1869, the last of 15 children of an illiterate farmer, Joseph Vacher was educated at a strict Catholic school. He was conscripted into the army and, when he was not promoted, he tried to cut his own throat. In 1893 he fell in love with a young serving wench named Louise. The love was unreciprocated, despite his best efforts, so he shot her four times. She survived and, in his desperation, Vacher tried to commit suicide but he, too, lived and he succeeded only in paralyzing one side of his face. He was sent to a mental hospital at Dole, Jura, but released after just a year. It was then that his murderous spree began. Between April 1894 and 1897 Vacher worked as a labourer and killed and mutilated one woman, five teenage girls and five teenage boys. The victims — mostly shepherds — were stabbed, raped, sodomized and often disembowelled. 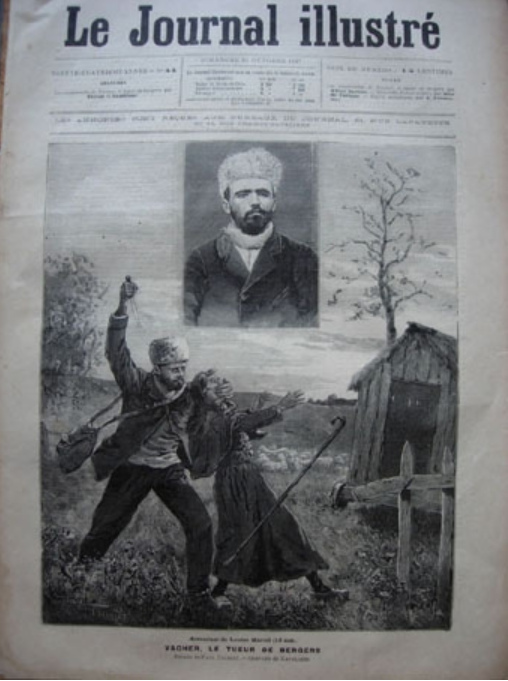 On 4 August 1897 he attacked a woman collecting pine cones in an Ardeche field but he underestimated her strength and determination and she screamed for help. Her husband and son came running at the noise and held Vacher until the police could arrive. Vacher was sentenced to three months in prison for offending public decency. Then, although there was no evidence to link Vacher to the string of murders, he confessed, “I committed the crimes… I committed them all in a moment of frenzy.” He claimed that he was mad, the result of a lick by a rabid dog when he was eight years old. Then Vacher changed his tale and said that he had been told by God to commit the murders. He was judged legally sane and was tried at the Cour d’Assises of Ain and sentenced to death on 28 October 1898. On New Year’s Eve he was guillotined and the executioners had to drag him to the blade. He was 29 years old.